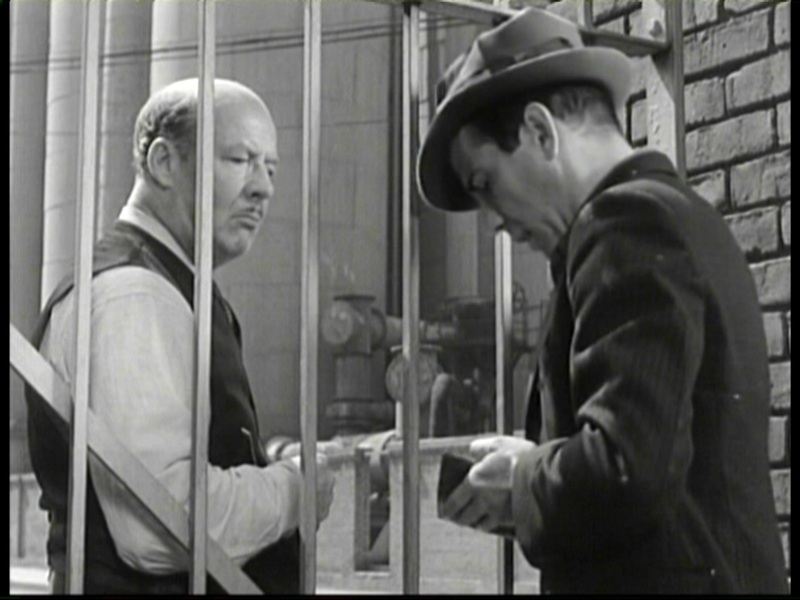 Charlie again out of work – tough times for Charles Foster Kane – matching views from Modern Times and Citizen Kane. I recently watched Citizen Kane (1941) for the first time in years, broadcast on TCM, and enjoyed it thoroughly. Having seen it many times before, the scenes and the dialog were all familiar, but still powerful and engaging. But now that I’m afflicted with ‘location-itis’ I couldn’t help but notice a common setting appearing in the Orson Welles classic with a scene from Charlie Chaplin’s Modern Times (1936) (see above and right). 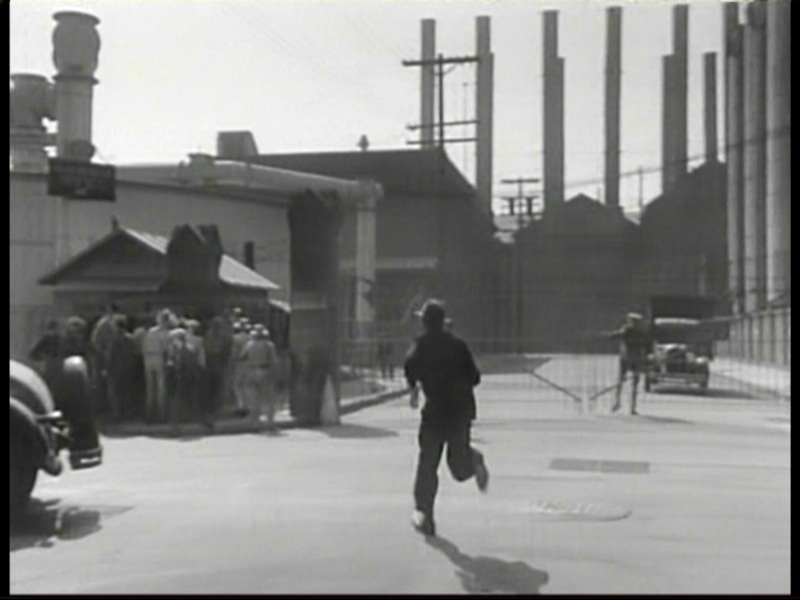 The closed factory gate depicting Charles Foster Kane reeling from the 1929 crash during the mock newsreel of his life at the outset of Citizen Kane is the same factory gate Chaplin used for the factory scenes late in Modern Times where Charlie and other workers recently re-hired after a long shutdown must suddenly go on strike, leaving Charlie once again out of work. You can read more about this Modern Times setting in my book Silent Traces. 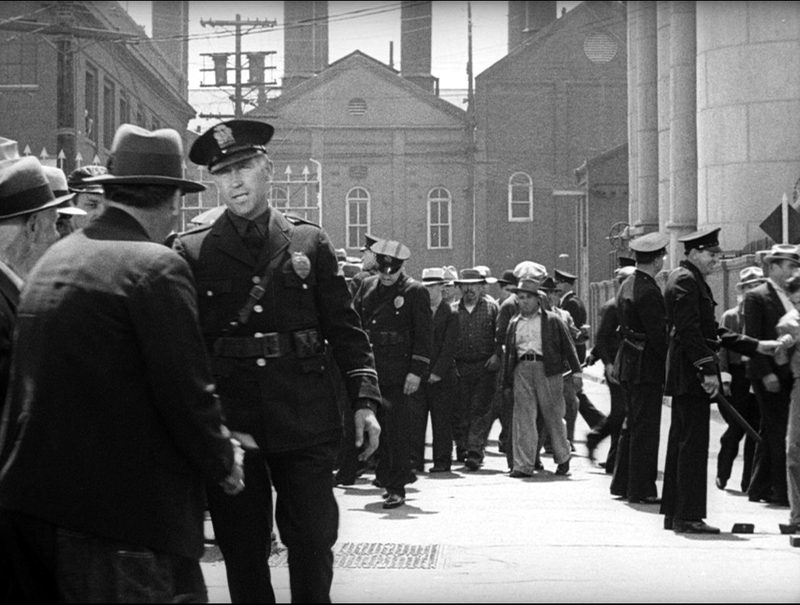 Humphrey Bogart runs to save his job in The Great O’Malley (1937). Bogie, down on his luck. arrange for his early parole. 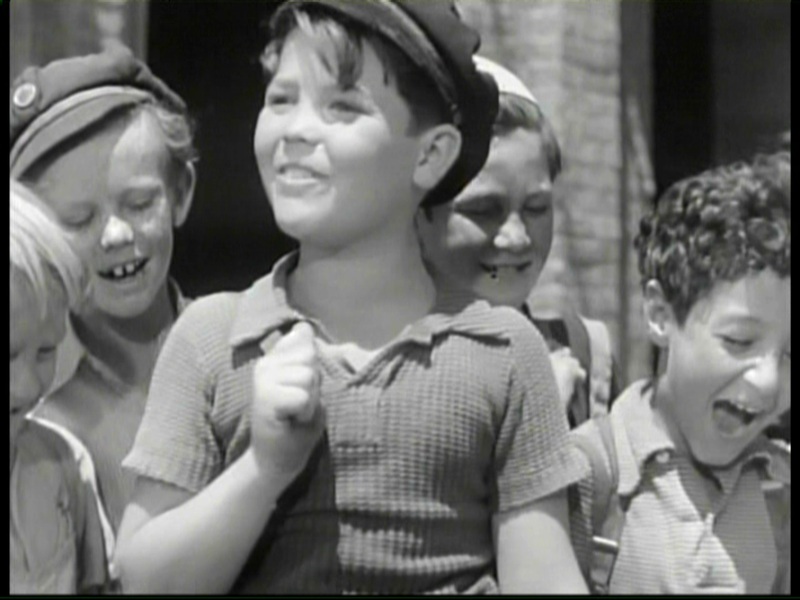 Delmar Watson appears with a credited role. The nine Watson family children, “The First Family of Hollywood,” appeared collectively in nearly 1,000 silent and classic-era films, and are honored with a star on Hollywood Boulevard. Their father Coy Watson Sr. was a Hollywood cowboy and special effects man who among other projects rigged the flying carpet for Douglas Fairbanks in The Thief of Bagdad (1924). Click to enlarge. 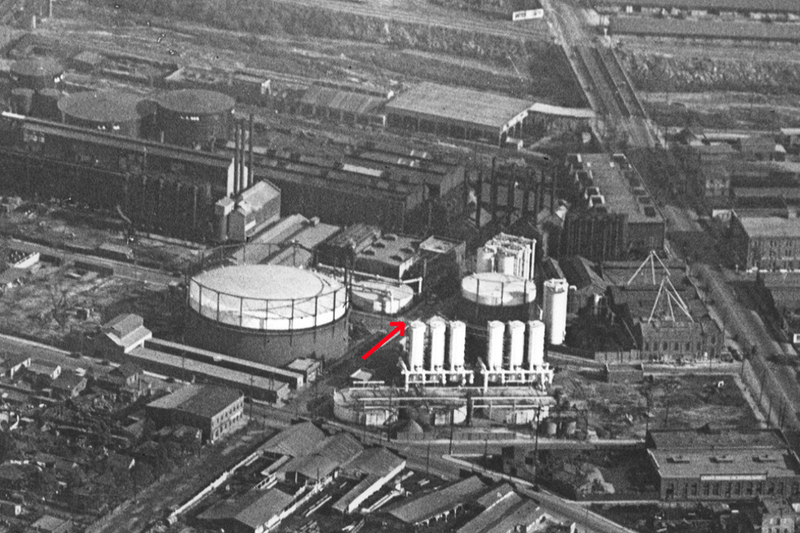 The factory gate stood at Ramirez and Howard (arrow) east of the former Chinatown. LAPL. 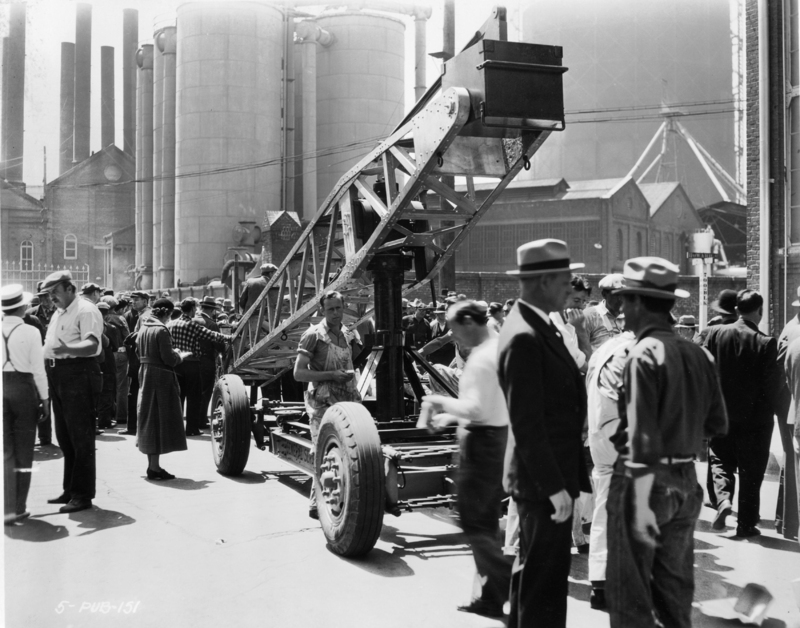 The Chaplin crew at work filming Modern Times near the corner of Ramirez and Howard (note the street sign at back). When I read correctly online that Balboa Park in San Diego, and Oheka Castle, the enormous Long Island estate of magnate Otto Kahn, were used to depict Xanadu during the mock newsreel footage from Citizen Kane, I couldn’t help myself, and created these ‘then and now’ images, presented below without further elaboration. Color images (C) Google. This entry was posted in Charlie Chaplin, Chinatown, Modern Times, Orson Welles and tagged Chaplin Locations, Charlie Chaplin, Citizen Kane, Humphrey Bogart, Modern Times, Orson Welles, Silent Comedians, Silent Comedies, Silent Movie Locations, The Great O'Malley, then and now. Bookmark the permalink. Thanks Chris – there’s one good thing in favor of today’s massively CGI movies – I can turn off my location brain, as there is nothing real on screen to pay attention to. John, I’d love to know which estate of the two is which in the last group of photos. Hi Andy – the single aerial view, and the view of the formal garden, are of the Oheka Castle in Long Island. All the rest are the complex of museums at Balboa Park in San Diego.